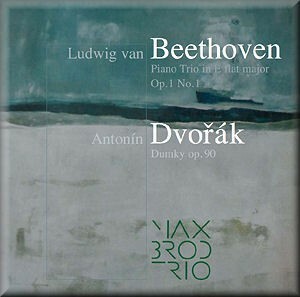 Beethoven / Dvořák - Ludwig van Beethoven - Mediální ohlasy - ArcoDiva management - Hudební agentura - Hudební agentura ARCO DIVA Management s.r.o. As far as I know this is the first release by the Max Brod Trio, formed in 2005 by happenstance, according to the sleeve-notes. It certainly must be followed up very quickly because this trio recording on the Czech label ArcoDiva has a freshness and unity we too seldom hear. The Beethoven is well represented on record. What the Brods do with it is to show sheer enjoyment with elucidation from the Mozartian and brilliantAllegro[10:40] to theAdagio cantabile[6:50] with its Beethovenian voice and thatnew soundwhich Mozart had nearly achieved in the last two symphonies. Beethoven uses the strings like Haydn but when the movement coheres we can hear the ‘Enlightenment’ torch with a more serious light playing through its flames. At first I felt that the Brods were a bit too quick in this movement but the cohesion of the ensemble served by a recording made in nearly live conditions is just right. The recording balance delivers Beethoven’s true voice in the Scherzo[4:55] with the piano spatially behind the strings but tying the whole concept together.